TOSS SSC, Inter admissions 2018, TS Open School Admissions, TS Distance SSC, Inter Admissions, TOSS application form, last date to apply for TS Open SSC and Inter admissions, TOSS Admission Schedule. 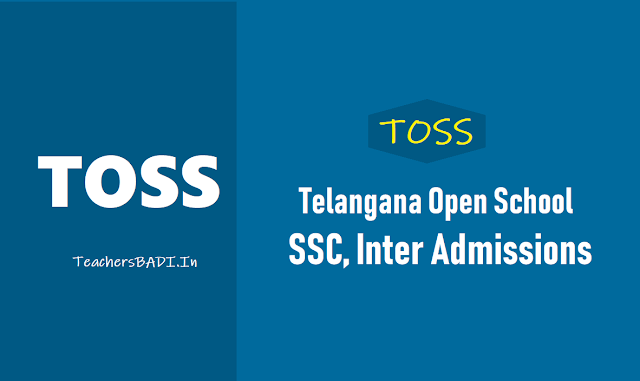 TOSS SSC, Inter Special Admissions Schedule 2019 and more details here: The Telangana State government has established its own Open School Society for admission into SSC and intermediate various courses to be offered in Open School Distance Education System. It is a great opportunity for drop out students to continue their education. The Telangana Open School Society has been dedicated for Telangana State only and TOSS will be for TS Open School admissions. TOSS will provide opportunities for continuing education to those who have missed opportunities to complete school and development education and to other children /persons desirous of pursuing school level education through open and distance learning (ODL) mode by offering courses and programmes of general education, life enrichment and vocational education up to pre-degree level. సార్వత్రిక పది, ఇంటర్‌ ప్రత్యేక ప్రవేశాల గడువును జ‌న‌వ‌రి 10వ తేదీ వరకు పొడిగించినట్లు జిల్లా విద్యాశాఖాధికారి తెలిపారు. ఈ అవకాశాన్ని విద్యార్థులు సద్వినియోగం చేసుకోవాలని ఆయ‌న‌ కోరారు. 2. జ‌న‌వ‌రి 10వ తేదీవరకు అపరాధ రుసుముతో పదోతరగతి, ఇంటర్‌లో ప్రవేశాలకు అవకాశం కల్పించినట్లు తెలిపారు. 6. అపరాధ రుసుం రూ.200 చెల్లించాలని తెలిపారు. 7. మండలంలోని అధ్యాయన కేంద్రంలో అన్ని ధ్రువపత్రాలు సమర్పించి అడ్మిషన్ దరఖాస్తులు సమర్పించాలని సూచించారు. The Telangana Open School Society (TOSS) has announced schedule for admission into SSC and intermediate courses through open and distance learning mode for the academic year 2019-2020. An admission notification will be released and application forms will be issued for students. Candidates can apply with prescribed fee for admissions. Candidates can enroll by uploading prescribed application form through MeeSeva /TS Online /AP Online centres. More details can be had from District Educational Officer or by visiting www.telanganaopenschool.org. తెలంగాణ ఓపెన్‌ స్కూల్‌ సొసైటీ ఆధ్వర్యంలో నిర్వహిస్తున్న ఎస్‌ఎస్‌సీ, ఇంటర్మీడియెట్‌ 2018-19 విద్యా సంవత్సరానికి ప్రవేశం పొందగోరే అభ్యర్థులు మీ జిల్లా పరిధిలోని అధ్యాయన కేంద్రాలను సంప్రదించి ప్రవేశ రుసుమును చెల్లించాలి. ప్రతి సబ్జెక్ట్‌ మార్పునకు రూ.150 చెల్లించాలన్నారు. ప్రతి సబ్జెక్టు మార్పునకు రూ.150 చొప్పున జ‌న‌వ‌రి 10 వరకు చెల్లించాలి. అపరాధ రుసుముతో జ‌న‌వ‌రి 10 వరకు చెల్లించవచ్చు . TOSS mission is providing pre-elementary Education through Open and Distance Learning (ODL) mode to School drop-outs and those missing Upper Primary stage of education and to attain Universalization of Elementary Education (UEE) in the State and provide continuing education for adult neo-literates, working men and women to reinforce their functional literacy and not to allow them to relapse into illiteracy. The TOSS Director would issue the TOSS SSC and Inter Admissions Notification time to time in every year for admission into SSC and Intermediate courses for the academic year through distance mode in its Open school study centers. The candidates can apply for 10th class and intermediate courses as per its schedule, which will be announced soon. More details will be updated on the official website or available at study centers. The enrolled students have to appear for the examination conducted by TOSS. There will be separate study material and examination pattern for open school system candidates. The degrees will be considered on par with regular candidates. Admission fee payable for SSC and Inter as for the following. Do not pay any additional amount of money for admission other than specified. A. For 10th Class: No formal educational qualification but candidates should completed 14 years is eligible. B. For Intermediate: The candidates who have passed SSC/Secondary course and Intermediate /XII failed candidates of other Boards can join in Intermediate courses in their study centers. Science candidates should take admission in Junior Colleges only. Eligible for Central or State government Jobs and Eligible for Higher studies i.e., Inter, Degree, EAMCET, B.Tech, Medcine, Agriculture, Law etc and and abroad also. These courses useful to govt/ private employees eligible for promotions. Eligible Candidates can apply through online mode only. So, The filled in Application forms, after certified by the A.I Coordinator, register through Online at Meea Seva centre, by paying requisite fee. Submit the original copy of application along with enclosures at the AI. Take the duplicate copy of application to Mee Seva for updation through online. Take the Admission fee receipt and printout copy of the online Registered application form Mee Seva and preserve it for future reference. Important Dates for TOSS Admissions:The Telangana Open School Society, Hyderabad released the following Schedule for admission into SSC and Intermediate Courses offered through Open and Distance Learning mode, for the Academic Year 2019-20. 4. Fee payment last date: 10-01-2019 and with a late fee up to:..
sir in website given there is no need of any formal education qualification but in study centers they asking all like study certificate and birth certificate.so its very problem for the students who wants to join ssc.so plz think over on this matter and one more thing plz extend the late fee date also. Respected, Telangana Open School Society All Officers , Sir please extend the late fee due date... plz.. Respected Sir, Shri Kadiyam Srihari & Sri S.Venkateswara Sharma,and TOSS All officers Subject to TOSS Admission 2015-2016 Request to please extend late fee due date..because actually lost of my original certificate S S C Marks list ,i apply S S C Board to duplicate marks list before one month,i asked before two days by officers of S S C Board ,officer telling already dispatched duplicate mark sheets by post, but still not reached my address ,and study center they asking original Mark sheet , due to that reason i request to kindly extend up to 30th September to submit originals.. please do the needful. Dear sir What is the last date for TOSS Inter. will there be any extension of date for admission. please provide the toss ssc and intermediate admissions last date,.,. Kindly requesting you to please confirm Tatkal date for ssc and inter Addmission. On sep 30th is last date and today is 13th oct then i think tatkal date is not declared yet. Please reply and confirm. Complete details at your mandal Open School Study Center..
sir, could you please tell when tatkal date will be announced? Please contact the nearest co-ordinator..
TOSS Exams Fee Schedule announced please open the link which was given in above post/article..OR Open the TOSS Label Link ..
Can mpc students also write 12th exams through this and get an equivalent degree as that of regular students? Sir please reply as soon as possible! Please update with nearest TOSS center from ameerpet and contact number if possible. When will admission for next academic year commence. please extend the date of open inter 2016-2017 admissions,.,. SIR THIS IS SAMAPTH I AM WAITING FOR ADMISSION FOR INTERMEDIATE COURSE SO PLEASE SEND ME ADMISSION NOTIFICATION DETAILS FOR THE YEAR2016-2017. Dear Sir, can you please inform and send me a last date for admission in inter for 2016-2017.. kindly provide a link..